Welcome to the Marina Village Inn website. We offer you the lowest rates and latest availability when you book direct. Welcome to the Marina Village Inn in Alameda, California. Alameda was once home to one of the largest known oak forests. Currently, this thriving island is separated by the Oakland Estuary and is home to beautiful Victorian homes, miles of beaches, a Naval Air Station, and seemingly endless attractions, restaurants, museums, shopping and hands down, the best view of San Francisco. 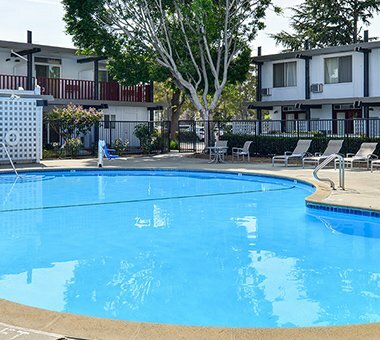 Our Alameda location keeps guests close to attractions like Jack London Square, and Lake Merritt, and we are conveniently located minutes from San Francisco. 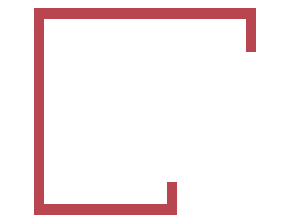 Additionally, the Oakland Airport and San Francisco International Airport are a short drive from our central Alameda, California location. 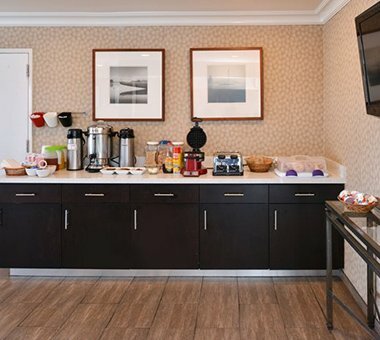 Our modern Alameda, California hotel offers a wide array of amenities and services to ensure guest comfort like a complimentary continental breakfast that is served daily, complimentary WiFi, a 24-hour front desk staff, complimentary on-site parking, and complimentary daily newspapers in the lobby. We also provide a sparkling outdoor swimming pool, a multi-lingual staff, daily housekeeping, and an inviting common area lounge with a television. Additionally, we offer a business center with fax and copy services, and we also provide luggage storage. The charming island of Alameda, California is home to a wide variety of attractions to keep you busy during your stay. There is the Alameda Museum, Pinball Museum, and the Alameda Naval Air Museum, USS Hornet Museum, and the Meyers House and Garden. There is a live theater at venues like the Altarena Playhouse, miles of beautiful beaches, a theater Cineplex, trendy restaurants, artisan distilleries, and tasting rooms, antique shops, golf, and more. Each well-appointed, non-smoking guest room at Marina Village Inn is equipped with complimentary WiFi, premium cable channels, a desk and telephone, a coffee maker, personal climate control, microwave and refrigerator, iron and ironing board, and a safety deposit box. 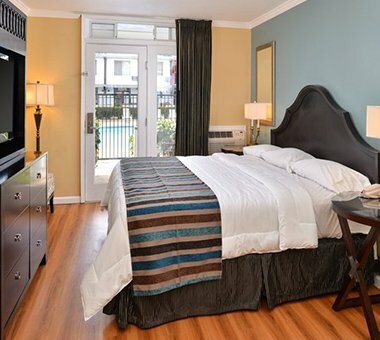 Each room includes a private bathroom with soft towels and complimentary signature toiletries. Select rooms offer a view of the Marina, and we offer family rooms as well. With advance notice to management, pets are welcome as well. The only thing better than traveling is traveling at a discount. Take a look at the exciting packages we offer and book your dream getaway. The charming island of Alameda, California is home to a wide variety of attractions to keep you busy during your stay. There is the Alameda Museum, Pinball Museum, and the Alameda Naval Air Museum, USS Hornet Museum, and the Meyers House and Garden. There is live theater at venues like the Altarena Playhouse, miles of beautiful beaches, a theatre cineplex, trendy restaurants, artisan distilleries and tasting rooms, antique shops, golf, and more. We invite you to take a closer look at our well-appointed tasteful guestrooms, beautiful grounds, a sparkling pool, marina views, and well designed common areas. All designed to deliver a relaxing experience to our guests. I chose a room with views of the marina. The bed was very comfortable, and the room was completely updated. The hotel is close to highways, so I was able to visit San Francisco and Oakland with no problems, and the hotel was quiet which was nice after sightseeing all day. Staff at the hotel helped me with restaurant and tour suggestions too. The location of this hotel was perfect. We were near all of the Bay Area cities while being tucked away in Alameda. The area is quiet and our room was comfortable and had great views of the marina. We will definitely be back.